These handprint snowmen are simple to make and so perfect for making a good number of personalised Christmas cards before attention spans wane. Paint your little one's fingers with white paint. Let them stamp it on a card. You might need to gently press down on each finger and then let them carefully lift off their hand. Draw on the features, hats and scarves with markers. Glad you liked it. We made ours into cards for the grandparents too! Loved doing this craft. 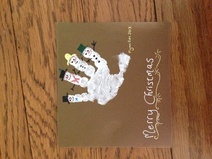 We've made ours into Christmas cards for the grandparents.